The Sinu San Jacinto bid round was announced with great fanfare on September 12th, 2017. The auction was supposed to have completed before the end of that year. Now, quietly, the date keeps slipping. The 14-week schedule that was initially established by the National Hydrocarbons Agency (ANH) for the Sinú- San Jacinto tenders was extended to 24 weeks. Representatives of oil companies and industry associations among others expressed concerns about the requirements to take part in the next auction organized by the National Hydrocarbons Agency (ANH). At an event hosted by consulting firm Willis Towers Watson, attorney Carlos Mantilla McCormick, expert on the Colombian energy sector, presented his vision on the Agreement 2. Claudia González, director of the National Environmental Licensing Authority (ANLA) spoke about fracking and delays in decisions for the industry. Between the end of July and the beginning of August of this year, the National Hydrocarbons Agency (ANH) will start offering new blocks, following the permanent allocation scheme that it announced recently. Canacol Energy Ltda (TSX: CNE) announced an agreement to a 50% farm-in with Pacific Exploration and Production (TSX: PEN) for a gas block near its other properties. 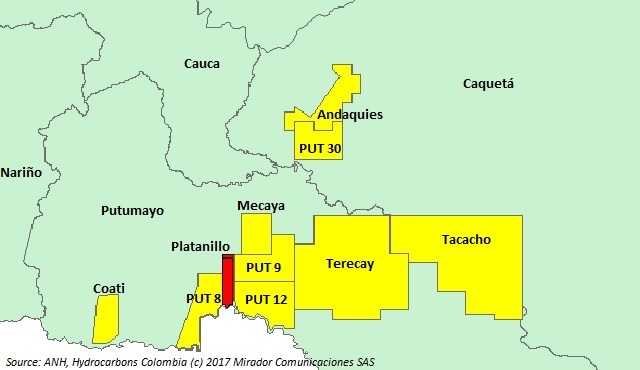 Amerisur Resources Plc (LON: AMER) announced asset acquisitions in the Caguan-Putumayo Basin. The blocks were bought from Pacific Energy E&P (TSX: PEN). The National Government failed to receive about CoP$23.6T due to the oil price drop and the sector crisis affected everyone. In September 2015, the National Hydrocarbons Agency (ANH) announced improvements and incentives to boost the sector. Nearly a year-and-a-half later, finally, the new regulation has been approved.